When you have multiple projects being completed at one time, things can start to get a little confusing. It can be hard to know what you need to work on, what needs to be finished first, and it can be hard to get up the motivation to do anything at all. This To Do List Template for multiple projects helps to keep things organized. This template includes space for the name of the project manager and the date that the task list was created, the template also includes space for the listing of multiple projects. Created in Microsoft Word in a way that is simple and easy to use, this template will help you to work professionally and get everything done right. This to do list template allows you to list each project and the steps that it will take to finish the project. Using this template, you will then be able to fill in the percentage that has been completed on each step of the process. 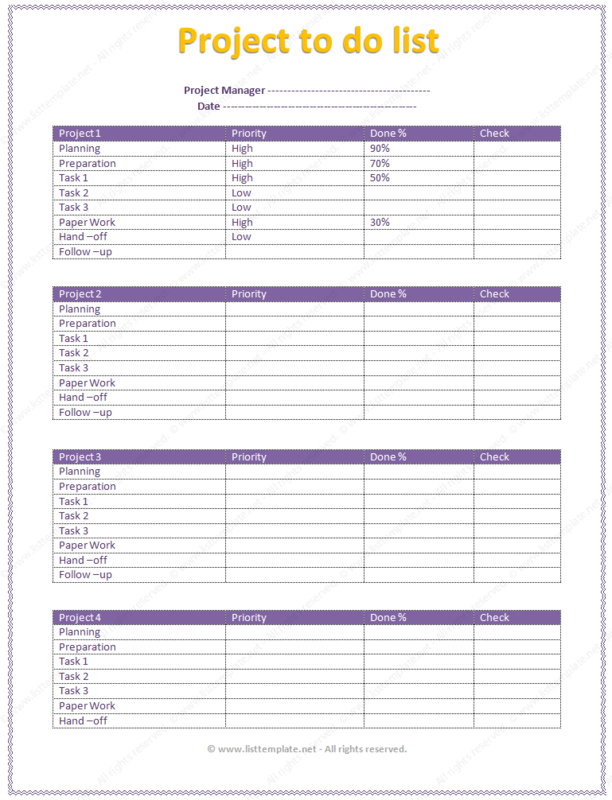 This project to do list template helps you to complete tasks professionally and on time.